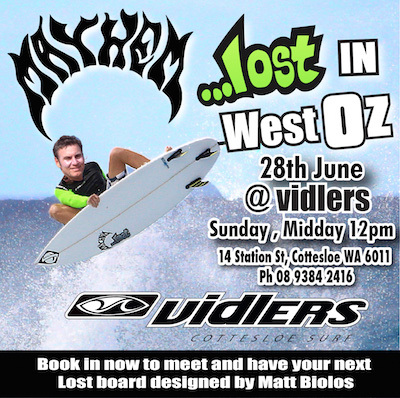 …Lost shaper Matt “Mayhem” Biolos is headed to Western Australia from June 27th – July 2nd and will be taking custom orders during a 3-stop shop tour. Talk one-on-one with Mayhem and design your next custom order in CAD with him. Pick his brain and tweak dims, outlines and more to create your magic board. Or ask him what board Taj is riding? Contact the shops below to book your appointment. July 2nd @ 3PM – Then off to Cave’s house for brews with the crew.